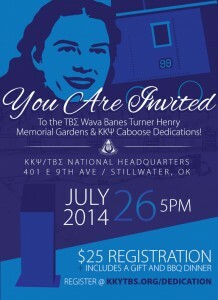 In the wake of the loss of our Founder, Tau Beta Sigma set our sights on creating a memorial to honor the late Wava Banes Turner Henry. Headed by Immediate Past National President Dawn Farmer, and with the help of Board of Trustee Members Lisa Croston and Kris Wright, the National Leadership developed a plan to create a memorial gardens on the grounds of National Headquarters in Stillwater, Oklahoma. Through many hours of research and planning, a vision was developed. This vision includes a black granite pedestal with a bronze relief portrait dedicated to Wava, a marble ground foundation of our crest and other symbolic items, benches for reflection and meditation, a rose garden, and other garden flowers and shrubs. 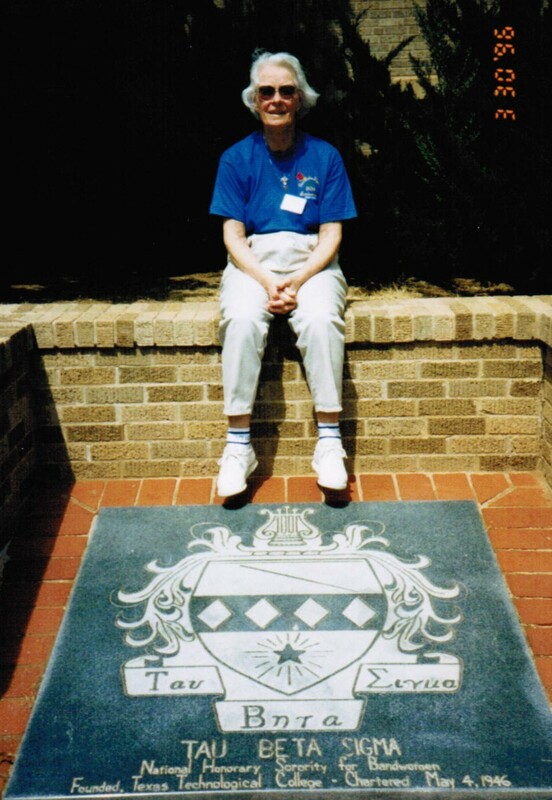 It will provide a quiet place for those who visit to reflect on Wava and the impact that she had on Tau Beta Sigma. This vision does not come without a cost, and the Board of Trustees volunteered to take on the task of raising the necessary funds to make this vision a reality. 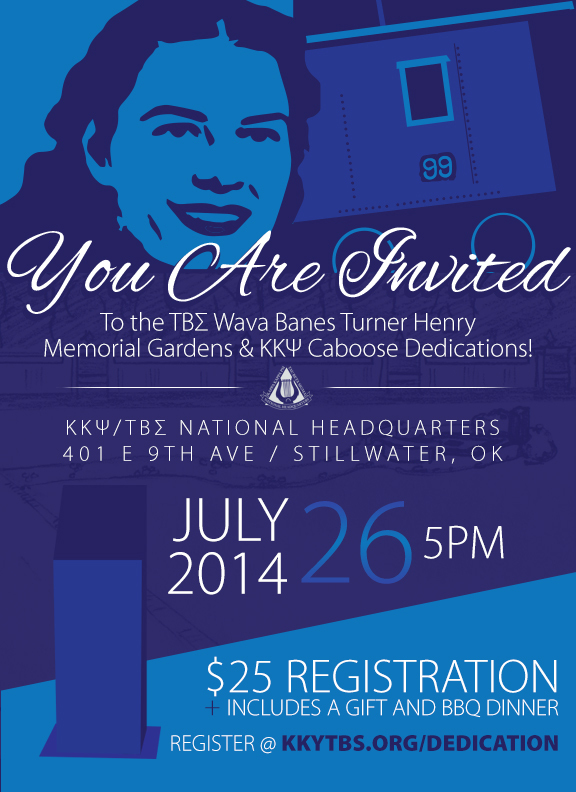 Beginning in March 2013, with the celebration of 13 days of Wava and a $5,000 donation from the Tau Beta Sigma Alumni Association (TBSAA), donations and pledges have been collected to help create the Wava Memorial Gardens. In addition, the National Leadership sold pins in honor of Wava, which were created as a gift from our National Jeweler, Kent Tracey. As of January 2014, we were within 90% of our goal. All those who make a donation of $25 or more will be recognized at National Headquarters, and donations of $1,000 or more will be recognized within the gardens. The donation campaign concluded in March 2014 for recognition purposes; however, donations will always be accepted for general grounds keeping and maintenance of the gardens. A formal dedication of the Gardens will occur in conjunction with the National Leadership’s Summer Council Meetings and District Leadership Conference on Saturday, July 26th at 5:30 pm. Please check www.tbsigma.org, the Tau Beta Sigma Facebook group page, and Twitter for additional information. The TBSAA is also planning additional activities for the weekend of the Wava Memorial Dedication (please see www.tbsalumni.org for more information). 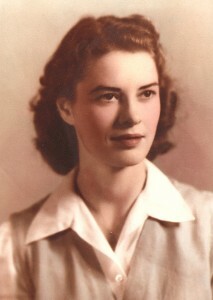 Reflecting on Wava’s life, we are encouraged to live with the courage and vivacity that she lived. Wava’s legacy will live on in each and every Sister, as we continue to serve bands to the best of our abilities, and promote the Ideals of our illustrious organization. The creation of this garden gives us an opportunity to reflect on her legacy, and build upon the future of an organization that she helped to build. Next story A Successful Camp For The Marching Knights!